Adopting a greener lifestyle saves the planet and saves you money as well – so really, it’s a win-win situation here! With a few ideas, a little nudge, a little getting used-to and you’re all well on your way to going green. Considering that the effects of climate change are undeniably being felt around the world today, it’s about time we start getting ourselves accountable for our own actions (or shall we say non-action?). It’s true that the world continues to change and will continue evolving, but the way we callously living on this planet is a big contributing factor in accelerating these changes in ways that are putting so many lives in peril. What you may be doing (or not doing) right now may seem like a small fraction considering the current state of our environment but remember that big changes starts from small actions. A movement comes from the collective effort to create such changes. A simple effort to go greener will come a long way in saving our planet – that is for sure. Mind the lights whenever you vacate a room. Make it a habit to turn off the lights once you leave a room, better yet, make use of natural lights! Turn your appliances off when not in use. Turning the ‘off’ switch oftentimes just puts it on standby mode – see that red and or green light? You have to unplug it. Use the washing machine or dishwasher wisely. Make sure that your laundry/dirty dishes are enough to fit one loading. Seriously, if it’s just a piece or two, you better just hand wash it. Opt for energy saving appliances whenever possible, it may cost a little more at first but it’ll save you more money in the long run. Consider using pail or bucket when cleaning your car. Take shorter shower, it’ll save you water and energy for the heater as well. As mentioned above, use your washing machine and dish washer wisely, one loading of these appliances consume so much water. Make it a habit to shut close faucets when not in use ‘yet’ say for example when brushing your teeth – you don’t have to keep the water running as you brush your teeth. Take any chance you can get to just ‘walk’ or even run. It’s healthier, saves you gas and spare the air of pollutants as well. Consider taking public transportation or taking a lift instead. Opt for organically grown produce – it’s healthier both for you and the environment! Make use of your kitchen, cook your own food! Buy only when you really have to. Consider garage sales or buying secondhand products online. Opt for products made from recyclable materials. Invest in a good water purifier instead. Bring your water canister/jug wherever you go. Make it a habit. Throwaways or disposable items sound convenient but recycling, reducing and reusing is way cooler!!! Opt for recyclable materials, skip plastics. 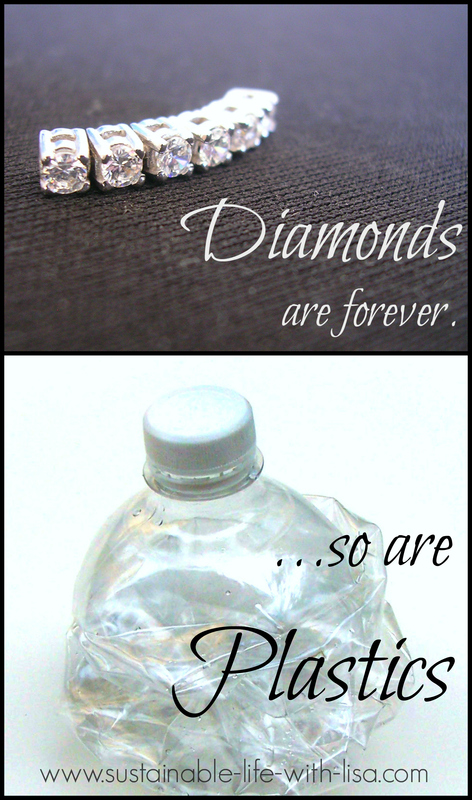 Remember, plastics are forever, they don’t biodegrade. Make use of your creativity and think outside the box – what may seem like a trash may not after all a trash yet! 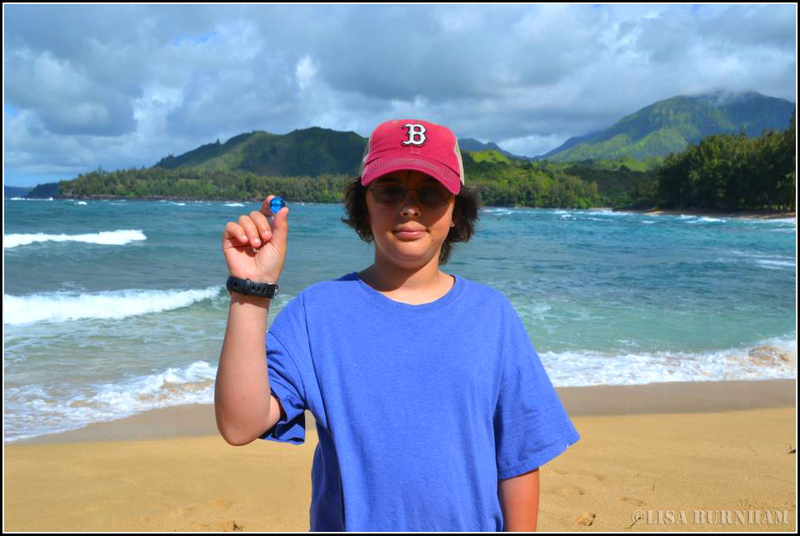 The Blue Marbles Project is creating youth awareness about sharing, giving, and gratitude towards one another and our blue planet. 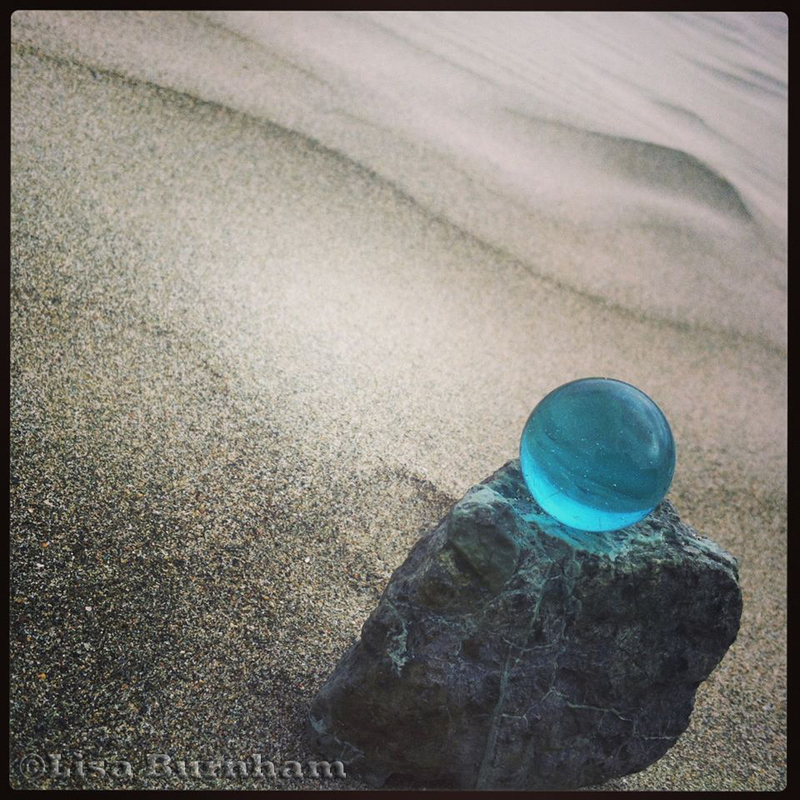 This project involves passing a blue marble from one person to another who has shown concern for our planet. From the simple act of picking up some random trash, to getting involved in a clean drive for instance, it doesn’t measure how big or small your part is, if you have a blue marble in your hand, it simply shows that you care. Getting the youth involve in this project creates such an impact to the way they see our environment; even the way they see each other. It makes them realized that what they do, really matter and is of value not just for the planet but to each other as well. It teaches them the value of giving and showing gratitude to other people. Sometimes the act of giving away the marble may seem hard at first for these kids, but they soon realize the importance of completing this act, and how much it will mean to him, to the other person he’s passing it to and of course to our beautiful blue planet. The blue marble signifies a physical embodiment of gratitude awarded by an individual for an act of kindness that one can proudly show and proudly pass on to the next deserving person. 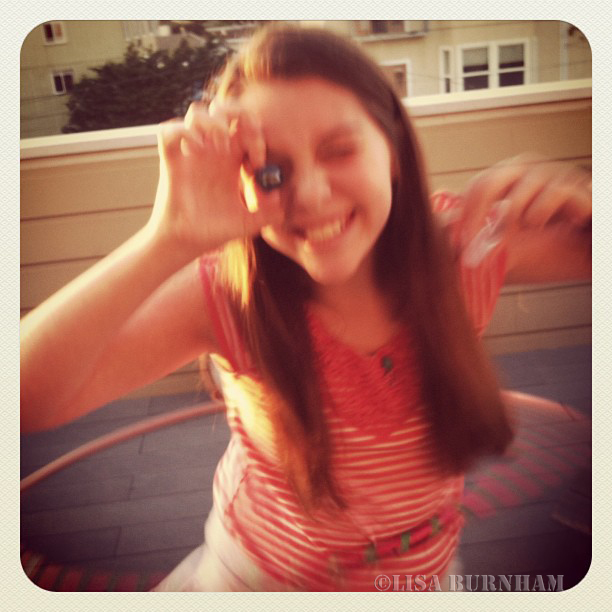 Make your move now and start involving your kids in Blue Marbles Project. Let’s create youth awareness and prepare these kids for a better future on a healthy planet. Let’s start while they are young. You’ll be surprised at how children could easily pick up on the positive values you’re teaching them. These kids simply need our guidance. They don’t have to grow up all rotten and spoiled, irresponsible and disrespectful towards people and the environment. Teaching them to respect living things on our planet will create a lasting effect and turn them into these individuals who are compassionate to fellow kids and their elderly as well. I it really boils down to what they see around them, to what they are unconsciously being subjected to. Like for instance if it’s so natural for their parents or adults around them to just throw trash anywhere as long as nobody is looking, it’ll create a notion in their minds that littering is okay and that it’s not a big deal. But try taking the time to explain to a child what a simple act of throwing for example, a simple candy wrapper in the ocean will do, you’ll be amazed at how they will react and how that explanation will impact and change their view about trashing the ocean. Let’s use women empowerment and take the responsibility to create youth awareness and empower the future generation. Let’s take it upon us to educate our kids – our young generation, about the importance of caring for our dear planet. Let’s promote green living and nurture them with an eco-friendly lifestyle. Let us always remind them and ourselves, as well, that this is the only planet we can call our home. In fact, it is our only home. 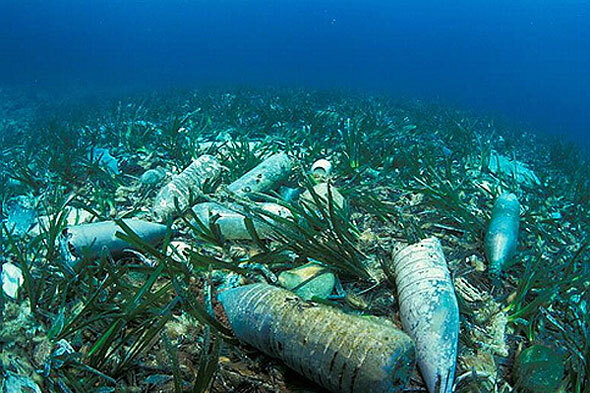 Trash pollution is undeniably one of the reasons that our ocean is facing a phenomenal degradation today. There is a considerable decline in fisheries, marine habitats are visibly destroyed plus of course the effects of climate changes that can be felt everywhere. You can argue that the earth is an ever changing world, that it continuous to evolve through the years, that changes are bound to happen – but we cannot deny the fact that humans are a big factor in creating unnatural changes and shift in this planet. Are sea turtles paying the price? Time and again sea turtle casualties has been reported due to fishing nets and boat accidents (still debatable whether intentional or not), but cases where trash is involve is not too new either. 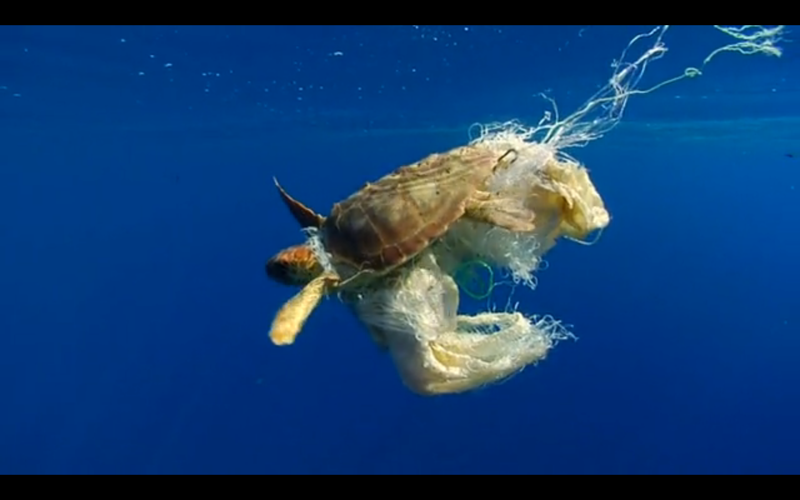 Sea turtles are literally dying from our trash, from our plastic trash. Some mistakes plastics for jellyfish, would feed on them until such time that it causes fatal internal problems. 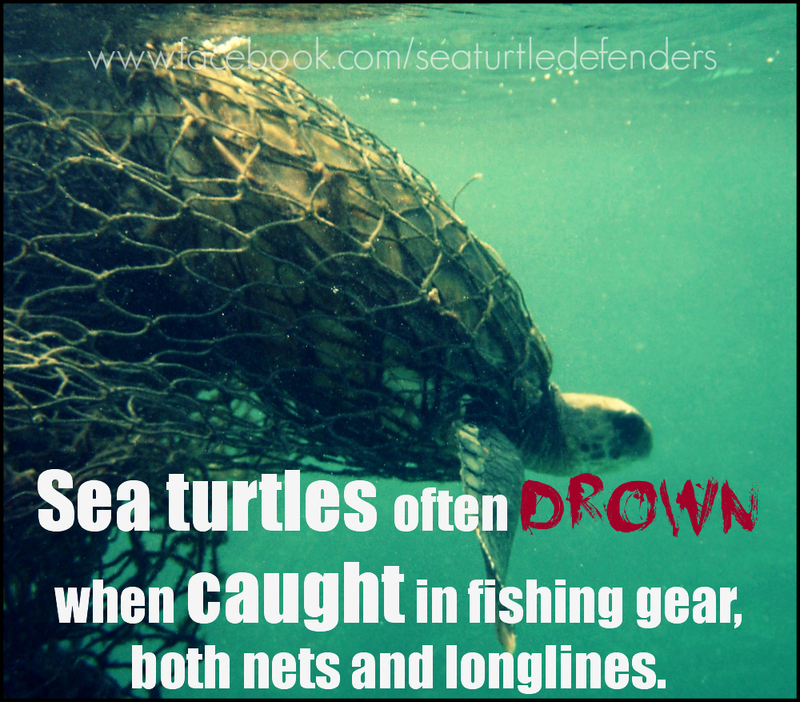 Some are being caught in abandoned nets or ropes and drown. Some gets trap with these plastics, would eventually survive but with disfiguring effects on them. While some more others are basically falling ill due to polluted waters. 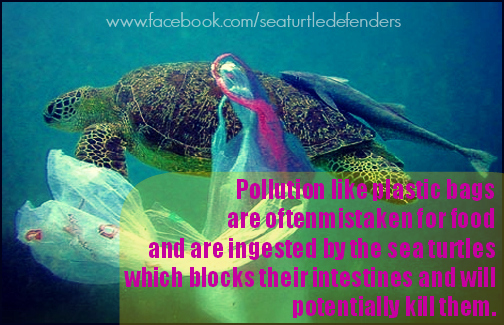 So yes, sea turtles are paying the price for the incessant trash pollution. We can begin by respecting the ocean as a sign of gratitude for all the abundance it’s giving us. We have to recognize the fact that not only does the ocean provide us with food and water, it also house magnificent creatures as well as organisms that made our very existence on earth a possibility. We must learn to care for the ocean and protect it. Protecting the ocean means protecting all the marine lives that live in it, and protecting their lives means protecting ourselves as well. 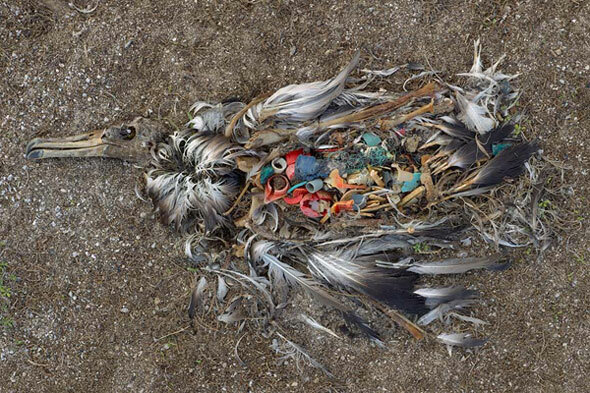 We can create awareness about the effects of trash pollution that all leads back to the ocean. We have to educate the people on how the existence of marine lives including the sea turtles are being threaten because of the enormous trash we are dumping in our waters. NOW, is a good time to start making changes. 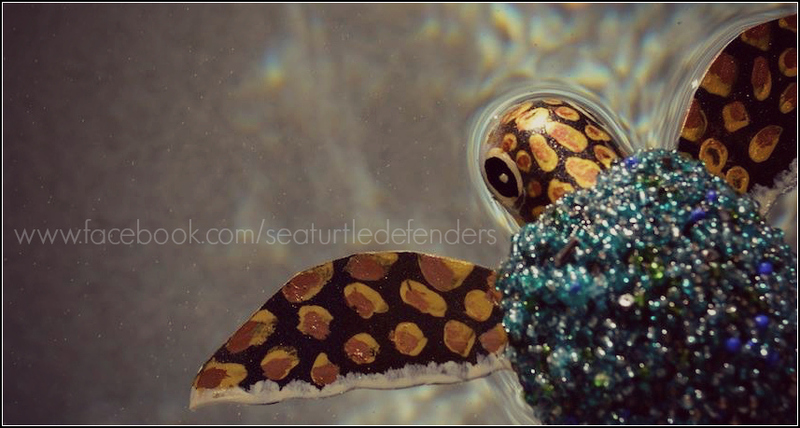 We can defend the sea turtles by creating awareness. People will tend to care more for something that they know more about. We have to continually educate other people about the importance of caring for the ocean. We can start small by being more aware on how we dispose of our trash. Remember that it all leads back to the ocean. Start considering a greener lifestyle, it’s not only good for our own health, but for the environment as well. Say no to plastics whenever you can, always opt for biodegradable and recyclable materials. Quite frankly, to care for the ocean and defend the sea turtles we have to be more proactive. We have to make sure that our voices are being heard. And we have to continue on doing that until radical changes are finally taking place. I’m very passionate about art; I have a degree in Fine Arts and even completed a Masters Program around the same time that I starting my own family. It was quite a challenge, and I can honestly say that it wasn’t easy – but it’s all worth it! Being able to be there for my kids on their formative years while keeping in touch with my passion for arts is undeniably one of the best decisions I made ever. 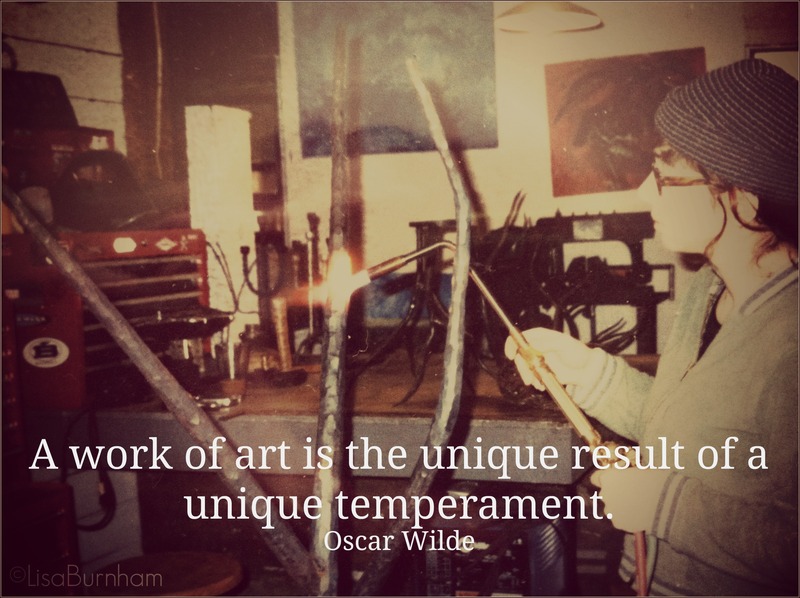 I was an art teacher for more than 20 years and also do glass arts – so basically my life revolved around arts. It’s very much a part of who I am really, I breathe art. I love art! I’m a strong believer that keeping your passions in life alive makes you a better person. It brings out the best in you. You become this person that can affect other people positively. You become a source of joy and hope. Probably you’re thinking that keeping in touch with life’s passion is the last thing we can afford to think of considering that we’re all so caught up with our jobs, making a living and other mundane things that have taken control over our life completely. But I truly believe that anchoring everything else in your life with your passion will ultimately bring focus and balance. When you’re passionate about something you make things happen – even things you probably thought you won’t be able to do now feels you can easily accomplish. Problems or trials or challenges become bearable if not easy. You see things more clearly. You make things happen. 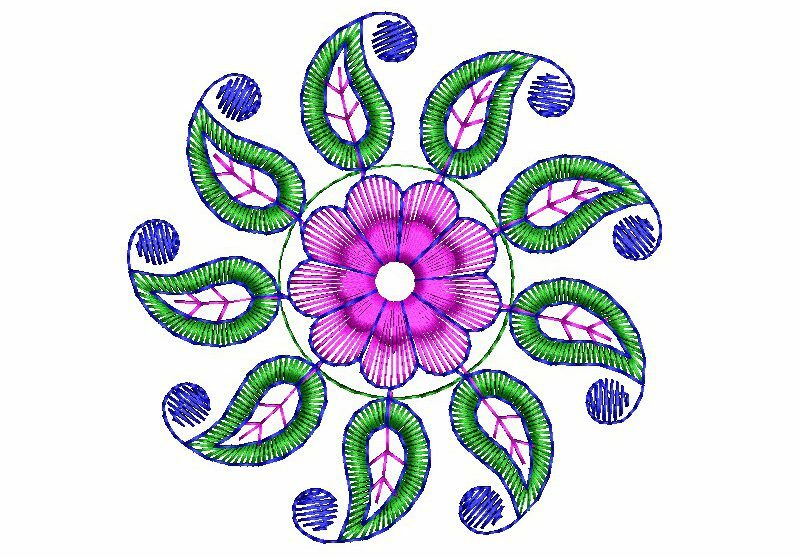 For me, channeling my passion for art brings my life in focus and in balance. It actually paves the way towards freedom for me. I can honestly say that I’ve regained control of my life living it the way I have always wanted to – spending quality time with my family, traveling to different places, nurturing meaningful relationships, creating a sustainable life and of course creating arts! When I decided that I’m going to empower myself and break free from whatever it is that is dragging me down to unhappiness – I found my inner strength, the superwoman in me – and started making changes in my life. These are not easy changes and I even faced harder choices along the way. I kept going anyway because it was clear to me that arts will always be (and have always been) a part of my life. That I know for sure. I muster the strength to delve into the business world, a world that is foreign for me, but it didn’t discourage me – I persevered instead! Now, I’m enjoying my freedom and still channeling my passion for art to continue on making changes to even better my life and to affect other people as well – all while creating a sustainable life for my family!